In the most recent update of the COPAS platform we have upgraded the system electronics and this moved COPAS to the newer, friendlier, more powerful FlowPilot software suite. This change is denoted by the name COPAS FlowPilot, abbreviated as COPAS FP. In this new version the model names COPAS BIOSORT, SELECT, PLUS and XL have been replaced by the more meaningful COPAS FP-250, FP-500, FP-1000 and FP-2000. 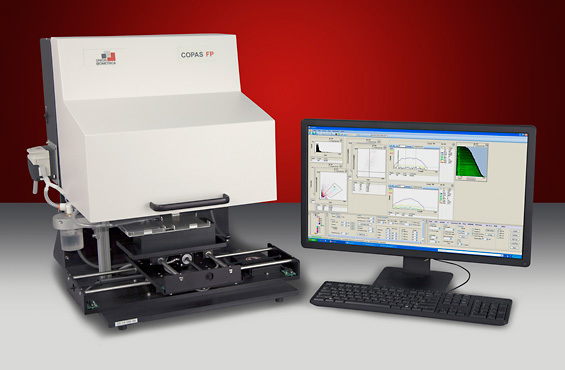 The COPAS FP platform is designed for the measurement of objects ranging in size from 20–1500 microns (diameter). Each of the four COPAS FP models features a fixed, specially engineered fluidic path, flow cell and optics optimized for a specific subset of that size range to provide maximum speed, accuracy, resolution and throughput, depending on the application. Instruments can dispense objects either into bulk receptacles or multiwell plates. A 488 nm solid state laser is used to measure both the size and optical density of the objects, as well as for fluorescence excitation. Each COPAS FP system can be equipped with up to three lasers. The real-time analysis of these measured parameters is used to make sort decisions and only those objects meeting the user-selected sort criteria are gently dispensed into multiwell plates or stationary receptacles. Those objects not meeting the sort criteria are diverted by a puff of air to a sample recovery container, where they may be recaptured, unharmed and still viable. Instruments are equipped with an X-Y stage to permit the dispensing of objects into micro-wells, including 24-, 48-, 96-, and 384-well plate formats. Using the FlowPilot™ software, users may custom design templates or use default templates. Factory trained personnel will install your new COPAS FP system and train you at your site in the operation and routine maintenance of the system and accessories. All systems are supplied with a Windows® workstation running FlowPilot™ software for operation and analysis. Each COPAS FP system features a specially engineered fluidic path and flow cell optimized for a specific object size range to achieve the highest accuracy and sensitivity possible. The table below summarizes the largest object size recommended for each COPAS FP model and also provides general system recommendations based on some sample applications. The applications listed are not exhaustive, but simply meant to provide a general overview of system capabilities. For a more detailed discussion of your particular application, including those applications that are not listed here, please contact our applications scientists directly at AppSupport@unionbio.com. * Size resolution with 500 μm not as good as with 250 μm, Fluorescence is OK, Speed reduced by 1/2. ** Bead sizes are "swollen" sizes in water (not dry).